The Seahawks would be open to re-signing Sherman at a lower salary than the $11 million he is due in 2018. But it's not thought Sherman is too eager to return to Seattle at a lower salary. Richard Sherman was in Las Vegas on Thursday attending NFL Players Association meetings and — according to a few pictures on social media, anyway — trying his luck at a craps table. And the odds are likely that Sherman soon will be an ex-Seahawk. Seattle did not make any transaction involving Sherman on Thursday. But barring something unexpected, the Seahawks are likely to release the star cornerback Friday, bringing to an end the Seattle career of one of the most iconic players in team history, if not all of Seattle sports. The Seahawks have explored trade options for Sherman, but nothing materialized, leaving them poised instead to release Sherman on Friday ahead of the beginning of the new league year Wednesday. Sherman hasn’t attracted much of a trade market because teams know he is likely to be released, he has an $11 million salary and is recovering from a season-ending Achilles tendon injury suffered in November. There’s also a thought Sherman would prefer to be released so he can choose his next team. Because Sherman is a vested veteran, his contract would be terminated and he would immediately become a free agent. The Seahawks would be open to re-signing Sherman at a lower salary than the $11 million he is due in 2018. But Sherman is not thought to be eager to return to Seattle at a lower salary and would rather move on with the opportunity to choose his own team as a free agent. Seattle was more than happy to keep Sherman but wanted to negotiate a new contract that would include a pay cut for 2018. 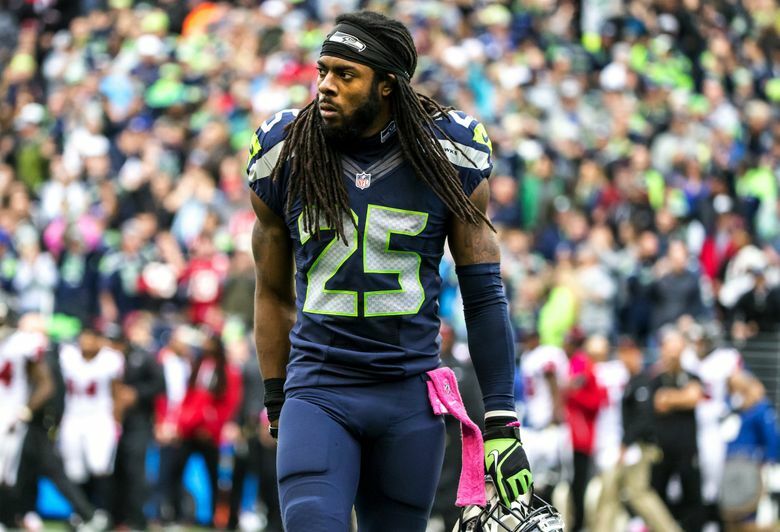 But Sherman balked at that, leading to the team’s expected decision to release him. Releasing Sherman would save the Seahawks $11 million in salary-cap room for 2018. And doing it by the weekend would give Sherman — who is acting as his own agent — a head start on finding a new team ahead of the beginning of the new league year Wednesday, when players whose contracts run out will officially become free agents. If Sherman is unable to play again, the Seahawks also would be on the hook for an additional $1.15 million in an injury protection payout, the same as could also be the case with defensive end Cliff Avril if the Seahawks release him and he cannot play again. But that’s unlikely with Sherman intending to continue to play, meaning Seattle would save $11 million, while taking a $2.2 million dead cap hit. Releasing Sherman is one of just a handful of moves the team has made or appears on the verge of making as it clears cap space on the eve of free agency. Seattle is also expected to soon release cornerback Jeremy Lane, which would save $4.75 million against the cap. Combined with the trade of Michael Bennett, which saves $2.2 million, and what also could be the release of Avril (which would save about $6.4 million with the injury guarantee factored in) Seattle would be creating roughly $24 million additional in cap room. Seattle is listed as having roughly $13 million as of Thursday morning but could have about $37 million with all of those moves. What the Seahawks plan to do with the money is unclear. Seattle has had veteran linebacker Brian Cushing and running back Jonathan Stewart in for visits the past two days. But both would almost certainly be one-year contracts for at or close to the veteran minimum if they sign. There was no immediate word on if either will. The Seahawks could be saving up to try to re-sign defensive lineman Sheldon Richardson, who the team declined to place a franchise tag on at $13.9 million this week, meaning he can become a free agent Wednesday. But in what is a weak crop of free-agent defensive linemen the general thought is that Richardson wants to hit the open market before committing anywhere. Seattle also could be creating space to extend the contract of left tackle Duane Brown, who was acquired in October and whose deal runs out following the 2018 season. Brown, 32, is due $9.75 million in 2018. And Seattle also could be creating some flexibility to extend the contract of free safety Earl Thomas. The Seahawks appear likely to keep Thomas rather than trade him but know they’ll have to give him a contract that could approach $14 million a year. He is entering the final year of a contract that pays him $10 million a season. Former NFL agent Joel Corry, who writes about salary-cap issues for CBSSports.com, threw out another idea Thursday. “What makes sense for them in the long run is to do (quarterback) Russell Wilson now,” Corry said. Wilson’s contract runs through the 2019 season with salaries of $15.5 million and $17 million the next two years and cap hits of $23.7 and $25.2 million. Wilson was the second-highest paid quarterback in terms of average per year at $21.9 million when he signed an extension before the 2015 season, behind only Green Bay’s Aaron Rodgers, but has since dropped to ninth. He’ll almost certainly fall to 10th when free agent Kirk Cousins signs next week. Cousins is expected to get a deal that would surpass the contract the 49ers recently gave Jimmy Garoppolo, which averages $27.5 million per year. Drew Brees is also expected to soon re-sign with the Saints, and Rodgers and Atlanta’s Matt Ryan could also get new deals, all possibly receiving contracts approaching or exceeding $30 million a year. Wilson likely would want something similar and probably would want to wait to see how the market plays out before re-signing. Otherwise, what exactly Seattle plans to do with its added cap room is hard to tell, especially with the free-agent market this year not regarded as overly attractive. Going big in free agency has also never been the Seattle way, with coach Pete Carroll and general manager John Schneider having preferred to build through the draft and then re-sign core players. And though getting up to between $38 million and $40 million in cap room by Wednesday could move the Seahawks to about the midpoint of teams in terms of available cap space (which will be a fluid standing with most teams making a flurry of moves this week), they could still be fighting an uphill battle for the few elite free agents, such as guard Andrew Norwell, who most expect to sign with the Giants. Ten teams have $47 million or more in cap space. Most thought the Seahawks were not likely to be big spenders this year, hoping to instead add compensatory draft picks in 2019 if free agents such as Richardson and Jimmy Graham sign elsewhere — teams can make trades this year based on the expectation of comp picks in 2019 and Seattle could use expected picks to try to add selections in the second and third rounds this year. Seattle has only its own pick in the first round at 18, then nothing until the fourth round (No. 120 overall) due to the Richardson and Brown trades. If Seattle signs some significant free agents, then the plan to acquire comp picks might go out the window, and it would indicate the Seahawks are still in win-now mode. But if not, as Corry says, “then next year could be a real challenge” in an NFC West featuring a Los Angeles team that has been making aggressive moves to stay at the top and a 49ers team that won its last five games in 2017 behind Garoppolo. About the only thing clear is that the Seahawks are going to look a lot different.